Large scale surveys of modern Irish history are not exactly new. Numerous comprehensive volumes of work had been published on the social, cultural and political life of twentieth century Ireland, especially in the latter decades of said century. F.S.L. Lyons, J.C. Beckett and of course R.F. Foster have published extensive works on modern Ireland, while Terence Brown, J.J. Lee and Dermot Keogh have focused their efforts exclusively on twentieth century Ireland. With such works already available one may have questioned the need for another extensive study. However, Henry Patterson’s work differs from many of the previous offerings in that it gives equal standing to the two states which were formed early on in the century. Some of the previous studies have tended to treat the North and the Northern question as a mere footnote in their labours on the condition of the Southern State. Patterson’s background, being what would be considered a liberal Northern Unionist, may also set him apart from the aforementioned authors, and give him added reason to look at the island as a whole. Set against the backdrop of two states which had already had the time to develop a deep antagonistic attitude to the other, the study bases its focus is on the Ireland of 1939 and beyond. This also differs from other works such as those by Brown and Lee, who begin with the traumatic birth of both states in the early 1920s. The year 1939 was arguably the first real test of nationhood in the young life of the Southern State. De Valera’s staunch insistence that the Irish state be master of its own destiny and not be drawn into the larger conflict on either side was a defining moment both in terms of the independence of Irish state and its relationship with both the Northern state and Britain. The horrors of war and a British, ‘blitz spirit’, contributed to a shared experience among certain sections of the population of the North and those in Britain, resulting in a solidification of their sense of British identity. However, this notion of, ‘all in it together’, does not tell the full story. Patterson explores the underlying politics of Northern life in the lead-up to war and argues that far from being an important component of the fight against Germany and an integral part of the Union, the Ulster regime was wholly unprepared for what was to come to the point that some in the British establishment believed that it had actually become a threat to the cause of the union. A highly complicated war-time period in the towns and cities in the North is adroitly depicted. A state which from its inception had been ravaged by sectarian strife was experiencing, somewhat paradoxically, relative calm between communities with increased war-time employment and the suspension of the always divisive Orange marches. It is also argued that there were signs of departure from the traditional voting patterns to a UK-wide swing to Labour politics. While this period is played out against the backdrop of the wider European conflict, Patterson does not exaggerate the importance of this trend, this was still a deeply divided society within a deeply divided island. While links, especially positive political links across the border were virtually non-existent for many decades, Patterson skilfully shows that political posturing on one side of the border invariably resulted in a reaction on the other, especially from south to north in early years. The rise of de Valera in the thirties saw a resurgence of republican feeling in communities in the North which had lain dormant over previous years and which inevitably compounded Unionist fears. Patterson carefully shines a light on the psyche of the ruling Unionist elite at the time and how they viewed what they saw as an enemy within allied, with an enemy at the door. The political posturing and reactions are a significant theme in this work right up to the direct involvement in seeking a final solution in the ‘fourth green field’. Unrest and dissatisfaction with the performance of the war-time Stormont regime is explained in terms other than mere sectarian strife. Economic and class dissatisfaction was a major problem that the Ulster party seemed incapable of either comprehending or doing anything about it. During the Second World War Northern Ireland accounted for 10 per cent of the total number of working days lost in Britain, while only accounting for a mere 2 per cent of the UK’s workforce. This research provides an important perspective away from traditional orange vs. green tribalism. An underlying theme, especially in the first half of the study, is of outliving one’s usefulness politically. On both sides of the border the electorate seemed to be saddled with a breed of politician which hung on to office too long. Elder figures from the inception of the Stormont regime are shown to still be clinging to power decades later, while the ‘1916 generation’ in the South were very much in the thick of it until Lemass wielded the axe, long after their relevance should have been questioned. Irish history, and in particular political history, has long been preoccupied by the cult of personality. However, the author avoids falling into the trap of building the study around these sometimes charismatic figures. All of the big names of twentieth century Irish politics are dealt with seamlessly in the larger narrative. Patterson’s expertise on Sean Lemass is undoubted and his previous work with Paul Bew on the former Fianna Fáil Taoiseach forms the basis for the material contained in this volume. His approach to Charles Haughey pulls no punches but is somewhat reserved in comparison to that of the more recent work of R.F. Foster, and of course that of Joyce and Murtagh. Figures of all shades right up to Bertie Ahern are accounted for. However, the study finished before Ahern’s less than triumphant exit from public life could be covered. A genuine respect for the political skill and academic intellect of Garret Fitzgerald is evident, while the knotty shadow of de Valera looms large over much of the early part of the work. The story of Northern Ireland’s most well known figures are dealt within the framework of the evolution of their political parties, many of the early politicians are portrayed as inept as rulers or marginalised and ineffective. The at times complicated relationships of more recent political figures from opposing quarters are navigated with a great deal of skill, from the steadfast ‘Never, Never, Never’, of Ian Paisley’s brand of unionism and ‘not one inch’ days of total incompatibility between nationalism and unionism, right up until the beginning of that most uneasy of alliances that persists through to the present day. Passages dedicated to the radicalisation of the 1960s generation differ from a lot of the traditional historiography which, quite understandably focused upon the Northern Civil Rights movement and the beginning of the Troubles. While Patterson tackles this in a typical thorough manner, he also discusses the lesser documented radicalisation and unrest of the young, mainly student movement in the South in the same period. Against the backdrop of the world-wide upheaval of the late 1960s and the political and economic stagnation of the previous decade in Ireland, numerous strikes and protests were organised which were met with an authoritarian streak from Fianna Fáil which Patterson argues had not surfaced since the Emergency. Strikers were jailed or fined for what Lemass called ‘anti-state activities’. Although Patterson’s investigations into unrest in the Republic of the 1960s are refreshing it would perhaps have been complimented by looking at the establishment of the campaign for the rights of Irish speakers with Gaeltacht based co-operatives in the 1960s and 70s and the Máirtín Ó Cadhain inspired Gaeltacht Civil Rights Campaign. Along with Seósamh Ó Cuaig and Seán Ó Cionnaith, they led a very public campaign to highlight the decline of the Irish language and agitated for more rights for the native speaking areas. The movement was not without its political successes and would inspire many young Irish people including future TD Éamon Ó Cuív into protest action. Based upon its impact in the State, it surely deserves inclusion. In truth, throughout this work there is scant reference to the Irish language, which has arguably been a central ingredient to much conflict and debate, especially in recent years in Northern politics. Given that the Irish language was an important part of the ideology of many republican prisoners in the Curragh in the 1940s and more recently in The Maze/Long Kesh in the 1970s and 1980s, it should perhaps have been given more exploration. The chaos, confusion, tragedy and utter futility which encapsulated much of the Troubles decades are almost perfectly captured in the chapters dedicated to that era. The author displays a sublime ability in recounting what was a chaotic period in modern history. His attempts an interweaving a complex set of groupings, ideologies and processes prove a lot more successful in producing an overall picture than the somewhat over-formal approach of one of the field’s standard studies by Flackes and Elliott. However, the enormity of such a task, objectively capturing the overall picture of an era which the author is so close to, begs the question, is it possible to truly dispassionately recount a set of circumstances to which one was a party to, albeit in the much removed role which the larger northern population was subjected to? The ongoing brutality of the republican campaign of violence is highlighted by many examples of the atrocities which afflicted those years. Whereas, the at times equally brutal campaign of terror by loyalist groups is not afforded similar analysis. The result is a slightly lopsided picture. It is impossible for any contemporary of the Troubles to be completely objective and Patterson does devote more space to republican brutality than loyalist. This is not a slight on the capabilities of the author, it is perhaps a task which no one who lived through an era which was at times bordering on anarchy could successfully achieve. Nonetheless, the interconnected chaos and human tragedy which is vividly captured within should be required reading for a number of the current crop of politicians of all shades in the Stormont administration, especially those who persist in attempting to make, at times, political capital out of the large catalogue of past tragedies. This study brilliantly shows the interconnectedness of two states on a relatively small island. The Southern state’s emergence from the disarray of the Civil War and partition to a time of bona fide nationhood with its obstinate stance during WWII shows the intent to succeed on its own terms. The years of depression, emigration and uncertainty which eventually paved the way for the success of the now defunct beast which was known as the Celtic Tiger, show an engaging post-colonial story. The passages dedicated to the economic rise of the Republic from an agriculturally reliant economy to a haven for multinational corporations is shrewdly connected with the increasing political clout of the South’s parties in seeking a lasting solution to the Northern question. In the North, the transition from a state, which at its own admission was there to cater for only one section of the population, through terrible years of death and violence to a position of relative peace and at times strained harmony between former enemies is robustly told. However regarding political violence the emphasis is perhaps too much on republicans and not enough on the loyalist groups’ campaign of assassination. This unfortunately has the effect of lessening the impact of that particular campaign on the reader and detracts from the overall picture. Nevertheless, this is a masterful piece of work, utilising a broad range of sources. 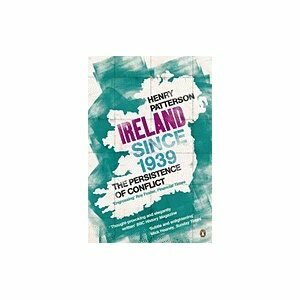 Patterson’s depth of knowledge of the intricacies of Irish politics is at times astounding and always engaging. Written by: Barry Sheppard on 28 November, 2012.